Lukáš Matejka, young Slovak “multilateral” artist, was born in 1987. Currently he is studying Master degree of Free Fine art specialization at Academy of Arts Banská Bystrica, Slovakia. Nowadays he lives in Trenčín where he creates as long as in Banska Bystrica. His creations are usually signed by his artistic pseudonym Akjetam produkt. His beginnings of creative career were connected with medium of painting. Gradually he has crossed the board from static pictures to pictures in motion, where the videoart has the main role. 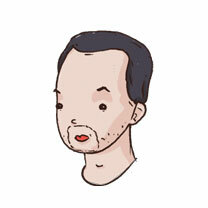 Since 2006 he has worked intensively with new medias in Digital media atelier – Doc. Michal Murin, ArtD. He plays with many marginal positions of medias. By interconnecting of many kinds of artistic forms he creates innovative art overlaps. Work with process dominates in his creative career and author personally puts emphasis on this work. The process is superior to the conclusion. His creative production is turned mainly to current forms like video, short film, net-art, multimedia projects, interactive installations, performance, vj and also graphic design. He regularly applies found footage technique into his (not only) film works. Contently, in wide range of perception, he deals with social research, contrasts between people and nature, intimacy, sensation, but also counterpoint like multilayered critic of war and institutions. Limitless openness to themes and forms makes from Lukáš Matejka nonconventional type of artist who is very difficult to categorize by the theme. Lukáš Matejka is founder, coordinator and curator of the project Videoart match-www.videoartmatch.com, that confronts European student videos and videoarts in public non-gallery scene. Lukáš initiated formation of civic association TRAKT www.trakt.sk, where he has been chairman since 2009. Since 2008 he has actively cooperated with international film festival Cinematik Piešťany where he compiles Videoart section. For the Dance studio Banska Bystrica he created projections to the inscenation Foam Days by Boris Vian. He prepared also theatrical projections for The secret of Skutecky´s house (Michal Ditte) and Paperback (Miro Dacho). Moreover, he cooperated with Platform DigiVAF(ex), Platform for current dance and theater P.A.T., Kremnické gagy festival, Pôton Theater Batovce etc. He involves and places on many home and international exhibitions, workshops or festivals. From the variety we choose exhibitions (Digital media, Velocypedia, 7seven touches, Level of movement, Limitless) and festivals (Nuit Blanche, Skyway, Theatrical Nitra, Azyl, Early melons, International film festival Bratislava, Ostrava-picture, Images contre nature, Minimotion, Videomedeja, CollogneOFF or 1.videoart festival in Syria).